Haven't you always wondered how a certain faucet or toilet will operate once it is installed in your home? Bathroom Place now offers the opportunity of live demonstrations for different products in our showrooms. For some people it is essential to test product quality and functionality before making a purchase. If that is your case, then Bathroom Place is the right place for you. 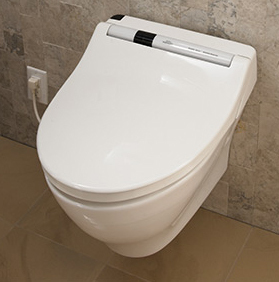 Our featured demo product of the month is the Washlet S300 from TOTO. You can visit one of our showrooms for a test of the functions and features this magnificent product has to offer. It includes: cleansing, drying, seat heating, and air purifying. This is a great add on that you can not allow yourself to miss and it can work in almost any toilet. Other products available for live demos include shower panels, shower heads, hand showers, frameless doors, and faucets. It is as easy as stopping in one of our showrooms and a sales representative will assist you with the demonstrations.